The NEW S.S.I. 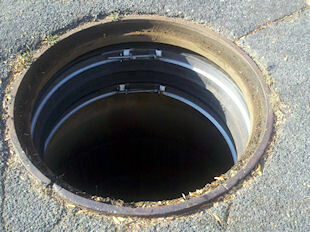 INTERNAL UNI-BAND is an inexpensive and permanent method of internally sealing the grade adjustment ring area of a manhole. The seal has foam backing to ensure a water tight seal over the rough/irregular surface of the structure, and stainless steel bands at the top and bottom with expansion bolts, allowing for precise adjustment to create a secure fit. To accommodate ground movement, S.S.I. INTERNAL UNI-BAND'S high quality Polyisoprene Rubber has 637% elongation. S.S.I. INTERNAL UNI-BAND saves taxpayer's money by not having to treat infiltrating water and by avoiding expensive repair and maintenance costs.